Glasgow Defence Campaign: GDC calls for major protests outside District Court on Monday! GDC calls for major protests outside District Court on Monday! The GDC is calling for mass protests outside Glasgow District Court on Monday 6 June in solidarity with an anti-cuts activist on trial after being arrested on protests in Glasgow late last year. Hundreds of young people took over the streets of Glasgow city centre on 9 December, inspired by the mass student demonstrations which shook London. Banks and multinationals were targeted as people vented their anger at the destruction of free education and those set to profit. Two activists from Fight Racism! Fight Imperialism! 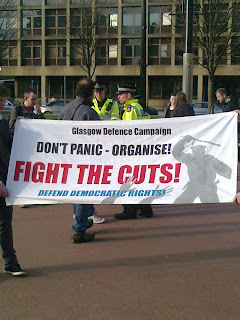 (FRFI) were targeted and arrested on the protests, having previously organised against political policing in Govanhill. The first entry on the Glasgow Defence Campaign’s log of police harassment dates from almost exactly one year ago. 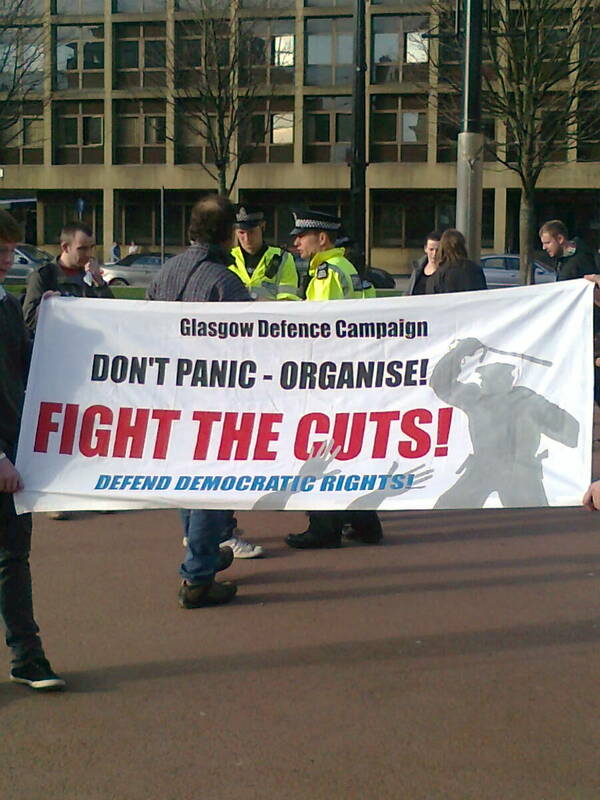 Since then, the fight against the cuts has continued to escalate and so too the fight to defend democratic rights as Strathclyde police proved its determination to disrupt and destroy any emerging movement. There has been attempts to ban the newspaper Fight Racism! Fight Imperialism!, arrests and frame-ups of activists on peaceful protests, police violence on demonstrations, house raids and frequent house visits, the arrests and illegal questioning of minors, the massive operation to evict the Free Hetherington occupation and Margaret Jaconelli, the issuing of draconian and politicised bail conditions, strip searches and much else. All this represents a massive defeat for the authorities in Glasgow. They have exposed themselves as profoundly weak and succeeded only in radicalising new layers of people who now have no illusions whatsoever in the true role of the police in the coming struggles. We have seen the police brutality against the comrades in Barcelona and know what will happen if we don’t organise. Throughout the last 12 months the GDC has consistently campaigned on the streets to expose and defeat the political harassment conducted by the courts and the cops. We have named and shamed the police officers involved and will continue to do so. From John Pilger and Tommy McKearney to Len McCluskey and the STUC, support is growing. Important successes have been won and unity built in solidarity with all those criminalised for their activity against the cuts. Stand together on the streets - stand together in the courts! Join the protest! We will not be intimidated!